Summary: Learn how to lay tiles in a diagonal pattern, find a diagonal guideline and lay the tiles. Quarry tiles and terracotta tiles are traditionally laid diagonally across the room, but any tiles can be laid in this fashion. If laying terracotta tiles, remember that terracotta is porous and to prevent the tiles becoming stained when you are grouting the joints, seal them with a branded sealer before you begin laying them. Alternatively you can make up a sealer by mixing boiled linseed oil and white spirit in the ratio of 2 parts linseed oil: 1 white spirit. Quarry tiles and terracotta tiles can be laid on concrete and timber flooring but because they are heavy, laying them on a suspended timber floor will require floor joists of at least 125mm (5in) to support the weight. 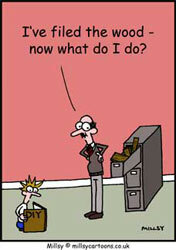 Concrete floors must be level and clean. If the concrete is uneven a self-levelling compound will have to be applied (see Applying a self-levelling compound to a concrete floor). A timber floor needs to be covered with 9mm (3/8 in) exterior grade plywood, fixing the sheets to the floor with screws 300mm (12in) apart (see Laying a plywood subfloor). From a corner of the room measure along one wall and make a mark at its mid-point. From the same corner make a mark the same distance on the adjacent wall. Join these two marks with a straightedge and you should create a guideline that makes a 45° angle with the walls of the room. Nail a batten along this line. The batten should be fixed in place with masonry nails if you have a concrete floor. Leave the heads of the nails proud of the timber to make it easier to remove the batten. 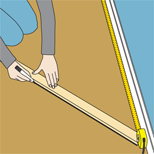 Nail a batten along a 45° angle. Even quarry tiles of the same colour will vary in shade, so before you start to lay the tiles open up the boxes and mix all the tiles up. This will achieve a more natural finish and avoid large areas of floor that differ in shade. Using a notched trowel, apply enough tile adhesive along the edge of the batten for a single row of tiles. Lay the first row of tiles with spacers between them to ensure uniform spacing between the joints. Push the tiles firmly into the adhesive. With the first row completed, place a timber batten across the top of the tiles and using a wooden or rubber mallet, tamp down the tiles. 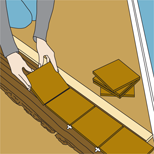 Remove the batten and spread tile adhesive behind the fixed tiles into the corner of the room. 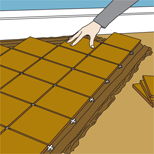 If you are tiling the floor of a large room it is best to work forward from the first row of tiles, returning to complete the corner of the room when the adhesive has been allowed to set for 24 hours. Continue to lay one diagonal row of tiles at a time to cover the floor area, using tile spacers at each joint. When you have laid four or five rows use a spirit level to check the tiles are level. If a tile is sitting proud of the rest tamp it down. On the other hand if a tile is too low, prise it up and apply more adhesive to the back and replace it in the row. With all the whole tiles laid you will be left with a series of triangular gaps around the perimeter of the room. Measure the two shorter sides of the gap, allowing room for grout and mark the measurements on the back of the tile. To cut terracotta or quarry tiles it is a good idea to hire a powered wet saw with a diamond cutting disc, as it produces very accurate cuts. Lay the triangular border tiles, applying the adhesive to the back of the tiles - not the floor - and maintaining a small gap between the edge of the tile and the skirtingboard. As you work around the room keep checking the border tiles are level with the rest of the floor. Allow at least 24hrs for the tile adhesive to harden. Apply grouting to the gaps between the tiles with a sponge or plastic squeegee with a flexible rubber blade. Wipe away any excess grout from the surface of the tiles as you go, to prevent the grout sticking to the floor's surface. The joints can be finished by running a small piece of dowel or a grout shaping tool along the joints to create a slight depression in the grout. Use spacers between tiles to ensure uniform joints. Measure the triangular gaps around the perimeter of the room. 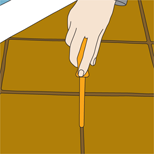 Finish the joints using a piece of dowel or a grout shaping tool.